Biggest news for your scribe so far is Emma Coburn being named the USATF Athlete of the Year. A Steeplechaser! In a sea of sprinters a distance runner emerges! Jerry Schumacher has been named the Coach of The Year for his work with the Bowerman Track Club. Congratulations to both Emma and Jerry! Turned down the Jesse Owens Hall Of Fame Dinner. I have never owned a suit in my life. 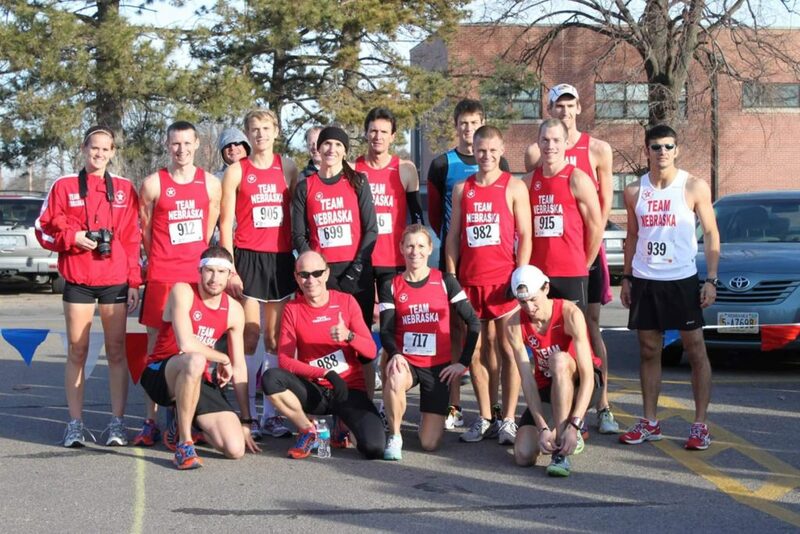 Packing up late next Friday to head to Lexington, KY. to watch Lincoln Running Company Racing, our semi professional running club that represents Eastern Nebraska. Lincoln now Nebraska’s sole representation at Club Cross. A whole lot of talented Nebraska athletes unable to make the trip due to 1- Funding (Run Guru Elite) and 2-Fielding a team (Team Nebraska). So here’s to Lincoln, our only egg in the basket and well played. The women look formidable, I anticipate the highest finish ever by a women’s team from Lincoln. Men’s Masters- 40+, Charles Smith. 50+, Craig Christians. Open Men- Andrew Jacob, Tom Nichols, Nolan Zimmer, Nolan Border, Jacob Olson, Ryan Dostal. Open Women- Erica Doering, Sara Fowler, Anna Hazard, Mary Hillis, Cassandra Krings, Hayley Sutter, Katie Wetzstein. As founder of our state’s USATF LDR program I reserve the right to see Nebraska running in a more global view. Nolan Zimmer, Jacob Olson, Luka Thor, Matt Pohren, Jay Welp, Grant Wintheiser. I send these 6 cats to nationals and they come home with a top 10 finish. Representing Nebraska. All of Nebraska. This entry was posted in Uncategorized on November 30, 2017 by runguru. Linda and I met a lot of people during Small Business Saturday. Dave and Martha scored one of the hottest properties in Omaha when they landed ROAST at Ak-Sar-Ben Village. Some serious foot traffic at 1904 S. 67th St.
A couple of fellas decked out in running attire, one looking kind of familiar, sat at a near table. Sweet spot for me. Took a break and a chance to sell my chemical free produce and Run Guru Events, LLC. The next 45 minutes were split just about 50/50 between the two. Brad Ashford knows a thing or two about agriculture in Nebraska. A Westside and Creighton grad, local all the way. A distinguished 40 year career in politics. He’s making a 2018 run to regain the seal lost in 2016. I’ll be pulling the handle for him. For his position and understanding of the issues we face. What that means to our community. I shared my vision of a Nebraska Agritopia. 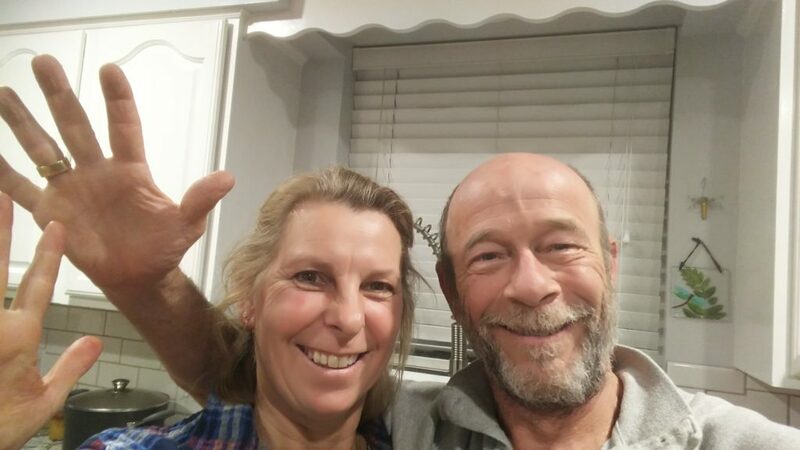 Mom and Pops like Bar None becoming the center of sustainable marketing, both education and real production of chemical free, locally sourced vegetables, eggs, fruits, honey, grains and more. Brad is also a runner. With over 50 years putting one foot in front of the other. Has completed 4 marathons including Grandma’s twice and Stockholm in Sweden. Symbolic because he represents “everyman” and running is something we can all do. The second half of my break then was all about running in Nebraska and in Omaha and what is going on in Waterloo with Run Guru Elite, Inc. in particular. Brad will be our official starter and celebrity participant at the 5th annual Two Rivers Valentine’s Day 5K. He is a friend of the running community. And we need all the friends we can get! This entry was posted in Uncategorized on November 29, 2017 by runguru. I hope you all wake up on your 60th Birthday. I feel blessed to have done so this morning. When in my 20s I couldn’t fathom it. In my 30s I probably dreaded it. In my 40s I finally accepted it. In my 50s I happily anticipated it. The more trips you make around the sun the more you realize how fortunate you are. A little bit of luck to be sure. Running lifestyle contributing vigor and gusto. To reach a new age group is reward enough. To enter it with 40 years of miles sugars it up nicely. This old piece of flint still has plenty of spark to give. 2017 will end up with more miles than my last 3 combined. With all due respect to the ortho specialists, you were so wrong to tell me to stop doing something that I love. An integral part of my very soul. Thank you Kaci Lickteig for giving me (and Linda!) the courage to get back out on the roads. I had planned on doing something running remarkable today. In the fashion of a couple of my old buddies (Ray Lapinski, Dave McGillivray) I had intended to put in 60 miles. After doing 10 on Sunday and consulting with Ray yesterday I bagged that notion. An easy run with my love will suffice. 1. Slow down. Good things come to those that wait. I will forever struggle with this one. 2. Be nicer to all people. They have their story too. 3. Stick to your principles, be your own guiding light. 4. Sometimes its better to be wrong, even if you’re right. 5. Better a leader than a follower, Tough Row as it is. 6. Each Day, Every Run is a Gift. 7. Love is out there. Real Love. Linda. 8. You can’t and shouldn’t try to please everyone. 9. Be Passionate. If its worth it you’ll have to fight for it. 10. Be Thankful for what you have. I’ve never been happier in my life. Thanks to Linda. I love and appreciate this woman more than I ever thought could be possible. Looking forward to the next 40! This entry was posted in Uncategorized on November 28, 2017 by runguru. Father of Long Distance Running. New Zealand in the 40s and 50s and 60s. Arthur Lydiard. I met Arthur in Galveston, he sketched out a training plan on a scrap of paper. One treasure I wish still resided in my collection. He changed the way people train and race. 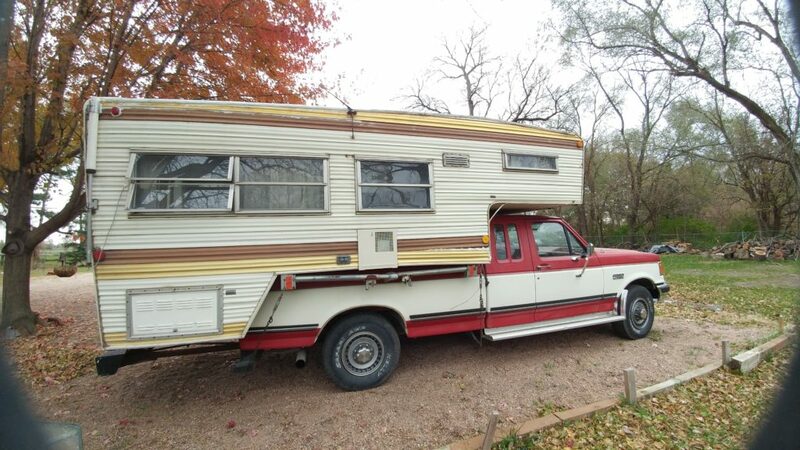 Arthur was a national class runner in his own right, results of his high mileage paradigm. Used the same methods on the lads from his working class neighborhood. Created champions and Olympians and Men. But also entertained anyone that sought his coaching. His home considered a haven for aspiring talent. 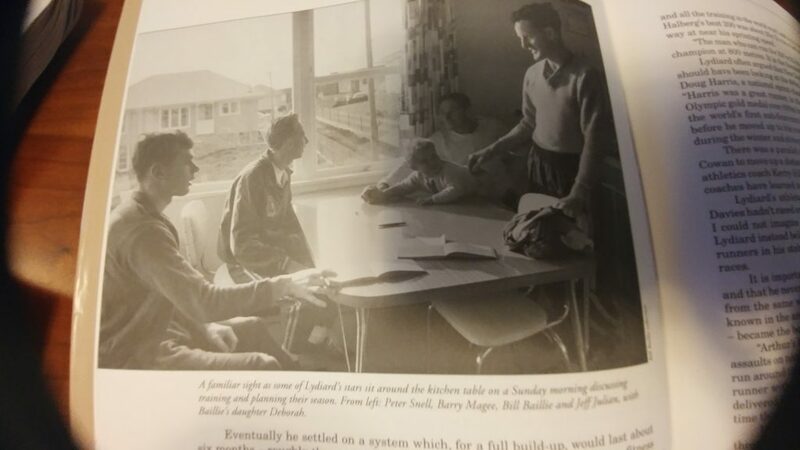 Peter Snell, Barry Magee, Bill Baillie and Jeff Julian at Lydiard’s table. This book was the inspiration and genesis of Team Nebraska. Having the best athletes gather for training, meals, and competition. Developing camaraderie and goals and plans. I’m still doing the same thing with Run Guru Elite. Every serious distance runner in Nebraska and America should know the origin of long distance running. The formula of high mileage followed by hills followed by sharpening followed by racing still the framework of success. I want to thank Jordan Tucker. I thought this, favorite among hundreds in my collection, was lost for the last decade. Jordan recently unpacked a box and found it. And mailed back. He was one of my original boys. This entry was posted in Uncategorized on November 27, 2017 by runguru. The 2011 Fremont Turkey Trot. I insisted on our athletes racing as a group. And dominating. How Team Nebraska was built. Same modus operandi with Run Guru Elite! Third row- Kelly Crawford, Peter van der Westhuizen, Andrew Jacob. These athletes are special to me. All of them. Willing to heed the clarion. Shaping the competitive landscape that all our USATF clubs now enjoy. Cory and Justin and Andrew still racing and well. Kelly Crawford doing yeoman’s work riding herd for the last 5 years now. David and Peter. Two sub 4 minute milers. On the same club at the same time. That they ran for me and the vision will always hold a very special place in my heart. This entry was posted in Uncategorized on November 24, 2017 by runguru. Thanksgiving. I was born on the holiday in 1957. Annual childhood pilgrimage from Atwood, Il to Grandma Katie’s one bedroom house in Indiahoma, Oklahoma. One block off of Quanah Parker Hwy. More Native Americans there than anywhere in the U.S. Sad chapter in our history. But this is Andrew Hartley Payne’s story. A young Cherokee from Claremore, OK. And his amazing run in 1928. C.C. “Cash & Carry” Pyle was a promoter and showman in the mold of another of my heroes, Phineas Taylor Barnum. 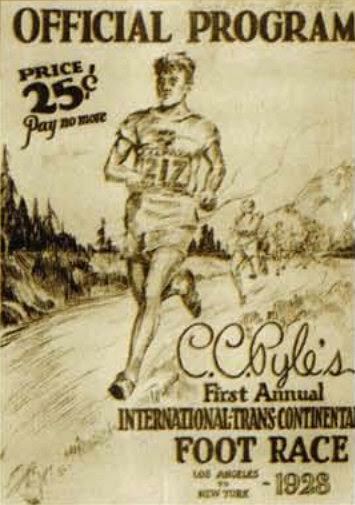 His ” 1928 Great Transcontinental Footrace” attracted the best ultra runners in the world. 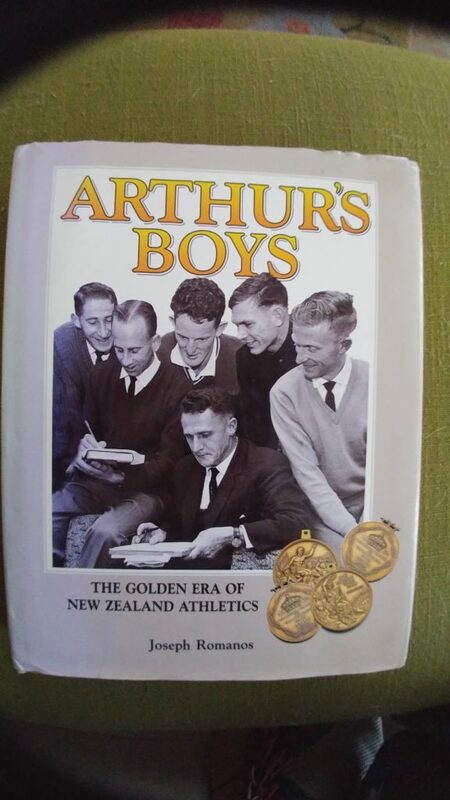 Niels Nielsen, Nestor Erickson, Ginsto Umek, Theodocio Rivera, Walter Grafsky, John Gobers, Kurt Peters, and the World’s 100 Mile Champion Arthur Newton. Celebrities, record holders and champions in their home countries. And the best runners of the time from the United States. Seth Gonzalez of Denver ran to Los Angeles for the start. Bill Bush had just walked across the U.S. in 65 days. The American favorite though a young Hopi Indian named Nicholas Quomawahu. And more than a handful of wanderers and seekers and desperados filling the field capped at 250. The start gun cracked at the Ascott Speedway in L.A. on March 4, 1928. Following the historic Route 66 for the most part, in stages. Five hundred seventy three hours, 4 minutes, and 34 seconds of running put Andy Payne first at Madison Square Garden. The exploits of this race, the grandiose vision of C.C. 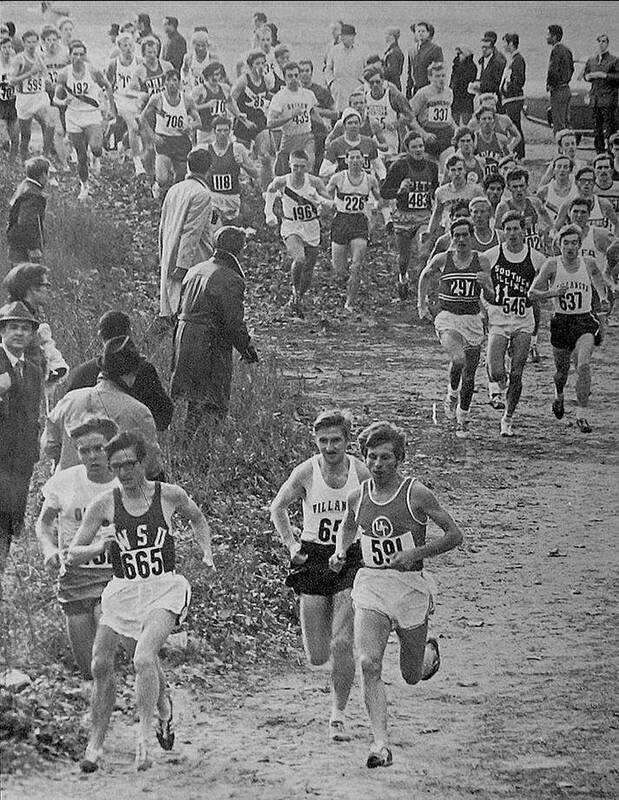 Pyle, the sacrifice and suffering and showmanship making this one of the most unique chapters in U.S. running history. Andy Payne winning it makes it one of the most inspirational. This entry was posted in Uncategorized on November 22, 2017 by runguru. Those Mom & Pops that are the backbone of every small town in the United States. People working at what they love, making ends meet and things work. Sometimes against all odds. Linda and I will be setting up Bar None Produce stand at ROAST in Ak-Sar-Ben Village this Saturday from 10-2, hope you will come see us. Owners Martha and Dave, successful coffee entrepreneurs, from Bend OR, came to Omaha over a decade ago with a dream. Shop Local. You might find it cheaper online. Better to support your neighbors instead of continually lining Amazon’s pockets. Shop Small. Find a hand crafted item that inspires you. From a local artisan. Buy it. Some of my dearest treasurers are hand turned, one of a kind. The pride of workmanship and passion resounding as clear today as when first moved. I’ve got registration set up on active.com for our 2018 Winter Fitness Series. Mom & Pop road race management, just Linda and I. Small and local and full of potential and charm. 2018 USATF members will receive $10 off the $35 registration fee for the Valentine’s Day 5K. We encourage your membership in USATF by also offering $10 off the $25 entry fee for the Halley’s Comet 10K. The potential for personal bests and state records on this pancake flat, 1.5 mile asphalt, closed course loop. So skip the lines and the whole Black Friday mess. Shop small, shop local! This entry was posted in Uncategorized on November 21, 2017 by runguru. Gerry Lindgren. World Record in 1965, as a high schooler. 27:11 for 6 miles. His 13:44 5K as a high schooler would last 40 years until Galen Rupp finally bested in 2004. 1964 Olympic Team. And a Lindgren. Will: Why is Island Living so easy? Gerry: Island living is nice because the best of weather is here year round. I can count on great running weather. People are friendly too. I can count on friendly people. Will: Whom was your favorite competitor? 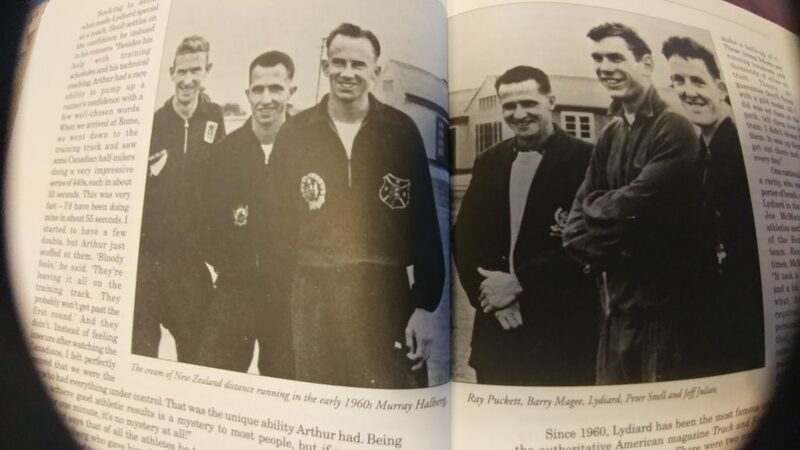 Gerry: My favorite competitor was Ron Clarke of Australia. He raced! There was never any doubt you would be in a super race if he was running. Will: Do you have any idea as to what your lifetime miles are? Will: Race most proud of? Gerry: My proudest race was a 10k race in Germany (Germany vrs. America) that I lost to Tom Laris. Gerry: The race I wish I could run over is the Northern Division Championship in ’66. I was on world record pace and I let up and missed the record. Will: Poke or coconut shrimp? Gerry: RRCA. There was not so much road racing in my day. A big road race would include 10-25 runners. Gerry: Puma had a flat that was so soft and seemed to fit my foot, but I cant recall the name. Will: Message to Nebraska distance running community? Gerry: NEBRASKA RUNNERS. Be the hammer, not the nail. Get beaten but MAKE it happen, don’t LET it happen. 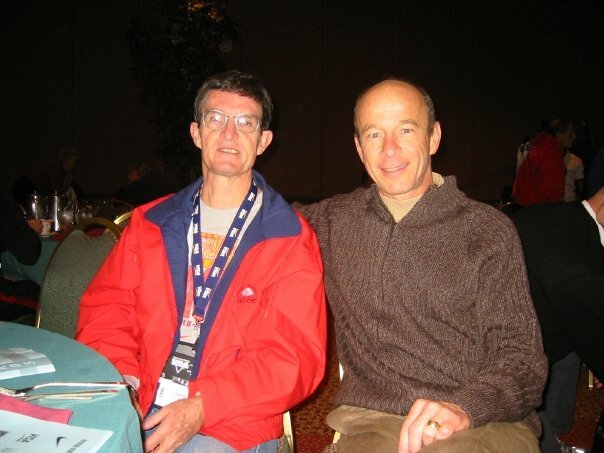 Gerry and I first met in Portland, 2004 while he was being inducted into the USATF Hall of Fame. Gerry and Pre battling it out at the NCAA XC Champs. 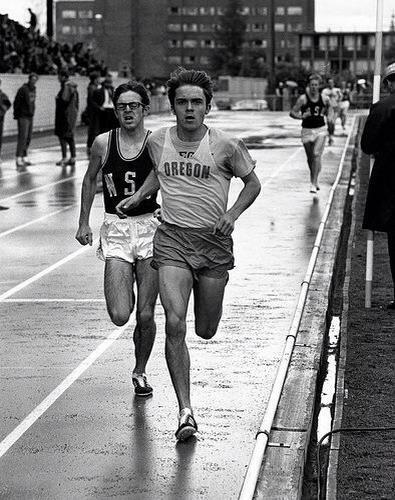 Whether on dirt or the track, Gerry was the only person able to run with and even out run Steve Prefontaine. This entry was posted in Uncategorized on November 20, 2017 by runguru. And cheer as the winners go by. This entry was posted in Uncategorized on November 17, 2017 by runguru. There are enough hands to go around. Yourselves and them covered the last two days. Today I’m looking for a hand for us. Who is us? Run Guru Elite, Inc. 501 (c)(3) not for profit set up to advocate for athletes serious about continuing their development with an eye towards local, regional, and national competitiveness. Tax ID #47-4966239 All donations are tax deductible. But who is Run Guru Elite, Inc? Grant Wintheiser. 23 years old. Former DIII XC National Champion. Fastest runner to represent any Nebraska club since Mike Morgan 15 years ago. His 1:06:15 at 2017 Garry Bjorklund Half erasing any doubt. Grant’s 50:51 at the 2017 State Farm 10 Mile in Lincoln the fastest in 20 years. He’s a medical student studying as hard as he races. A once in a generation talent. He deserves a hand. Jay Welp. 25 years old. Former GPAC XC Champion. Outkicked LRC Racing (Johnny Rutford) and Team Nebraska’s (Colin Morrissey) very best at the State Farm 5K, surprising everyone but me. Racing often over the next 5 months with an unblemished record. High school teacher that works as hard as he races. He deserves a hand. Nicole Norris. Nothing but personal bests this year. An 8 minute improvement (1:25) on her half marathon personal best. Marathon debut of 3:13 at 2017 Grandma’s on her 36th birthday. Mother of two delightful children. A stay at home mom that works as hard raising her family as she races. She deserves a hand. Elizabeth Starbuck. 22 years old. The fastest female to run for me since Gina Morgan 10 years ago. Goals of sub 17 for the 5K. She trains as hard as she races. She deserves a hand. Abby Schlater. 26 years old. Two time Iowa state champ. Pure miler. Looking towards the 2018 indoor season. She deserves a hand. Mark Abrams. 25 years old. Former GPAC 10000 Champ. The only fella I’ve met that has promised to beat Jay. Great fit for that alone! He dreams as hard as he trains and races. He deserves a hand. Jeremy Morris. The baddest trail runner from Nebraska. And by bad I mean the best. More miles and races than anyone else I know. He deserves a hand. Angee Henry. One of the most decorated female track and field athletes in Nebraska history. She deserves a hand. Jackie Freeman. Mother of two, full time job. Half and full personal bests this year. She deserves a hand. Amber Sargent. Full time job. Sub 3 hour marathoner. She deserves a hand. Sean Skillern. Nick Knowles. Tristan Nelson. Ashley Schurman. Stacy Mangers Shaw. David Frost. Kray Zeller. Michel Davy. Craig Halverson. All solid. All working their butts off. They deserve a hand. I’m asking for a hand for these athletes. They need uniforms. They need entry fees reimbursed. They need travel and hotel assistance. They need continued opportunities. Donations should be made out to Run Guru Elite, Inc. and mailed to 304 South 259th St., Waterloo, Nebraska 68069. This entry was posted in Uncategorized on November 16, 2017 by runguru.